Richard Dawkins is arguably the modern poster boy for Charles Darwin. However, a key difference radically separates the two men. Darwin believed in the existence of God and calls God the Creator seven times in The Origin of Species. Dawkins, in contrast, claims, The more you understand the significance of evolution, the more you are pushed…towards atheism. It seems Professor Dawkins thinks Charles Darwin didn’t understand his own theory. Just months after the 2009 discovery of the supposed missing link, author Ray Comfort turns the tables on evolutionists. In Nothing Created Everything, he examines the evidence for evolution and shows it is lacking. He demonstrates that when it comes to explaining how life began, atheists and evolutionists offer faith not facts. 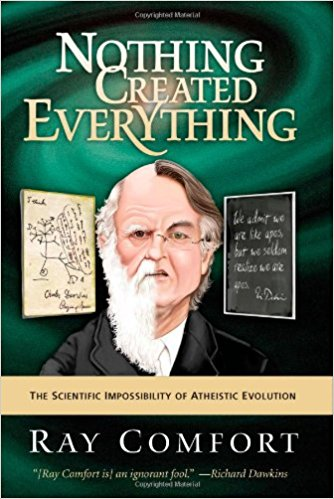 Ironically, atheists insist nothing created everything, a scientific impossibility. In a conversational tone, Comfort speaks to both atheists and believers and urges this discussion be based on hard evidence. And when it is, he insists, people will realize evolution is a theory that can’t be tested or measured and therefore can’t be scientific.